I have always extolled the virtues of the catalogues that accompany major Egyptian exhibitions, and this volume is no exception. 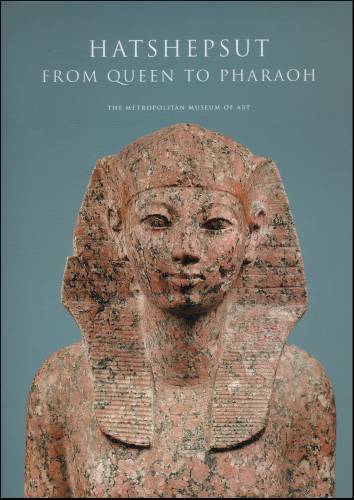 It is much more than just a catalogue of the current exhibition now showing in the Metropolitan Museum of Art in New York, which features objects loaned from Egyptian collections all around the world as well as many objects from the Metropolitan’s own substantial collection. The objects, ranging from small faience figures to huge granite statues, are all superbly illustrated and described in detail. This catalogue of the exhibits forms the core of the book, as would be expected, but they are put into their historical and artistic perspective. The book is arranged in sections. "Setting the Scene" looks at the run-up to Hatshepsut’s reign, international relations, art and religion. "Hatshepsut and her Court" looks at Hatshepsut’s role as Queen and then the joint reign of Hatshepsut and Thutmose III; at the role and position of Senenmut, Royal Tutor to Hatshepsut’s daughter; at his own tomb and the intact burial of his parents. "Hatshepsut ’ s Building Projects" looks at her statuary and her temple-building and the two tombs in the Valley of the Kings associated with her. This includes some rarely -seen images of the excavations at Dier el Bahri, which uncovered many statues, all broken into fragments in antiquity. "Decorative Arts" examines many aspects of art during Hatshepsut’s reign, from jewellery to pottery. "The Proscription" and "The Aftermath" look at the career of Hatshepsut’s successor as sole ruler, the warrior pharaoh Thutmose III. There is a huge bibliography for anyone who, having read this book, needs more information on the Queen and her times. The reign and role of Hatshepsut have always been of great interest, and this exhibition enables the latest research and ideas about this important period of ancient Egyptian history to be re-appraised. The book is truly sumptuous, a delight to read, a visual feast and, with a wealth of excellent information, is an absolute must for anyone interested in this period; it will be a valuable reference book for future students and enthusiasts. Published by The Metropolitan Museum of Art, New York/Yale University Press. Hardback. ISBN 1 58839 172 8. Lithographs by David Roberts R.A. The Lithographs of David Roberts will be familiar to most readers of AE, for they are as popular today as when they were first published in the mid-nineteenth century. 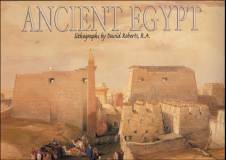 This book features sixty-one of the superb lithographs created by David Roberts following his visits to Egypt. The detail he managed to include in his images is truly astounding, even if sometimes he did exercise artistic licence and moved some elements of the buildings to create a better composition! The text in this book is m i n i m a l , leaving the large full-colour images to speak for themselves. If you know and love the works of David Roberts, you will find that the high quality of this publication really does them justice, and for those of you who may not have seen such a full set of his prints in one volume, then you are in for a treat. Published by White Star. Hardback. ISBN 88 544 0090 4. This is a revised edition of a book first published in 2001, when it was the first specifically to target the needs of families with children. 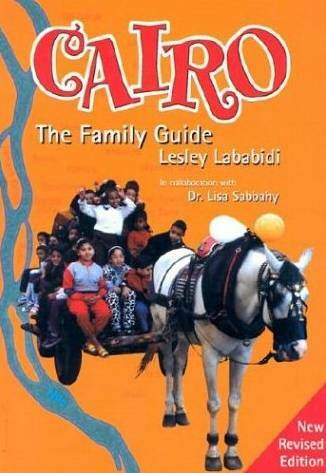 Cairo: The Family Guide provides all families living in Cairo – expatriate and Egyptian alike – with the resources and information needed to explore the city to the fullest. The guide is easy to use and is organised by geographic area. Each section begins with an overview of the area’s history and residents. The guide is illustrated with photographs, line drawings, maps that pinpoint sites of interest, and plans of museums and other places of importance in the area. Each section also includes practical advice on how to get to each location and what to take on visits. Bearing in mind that an enjoyable afternoon means something entirely different to a six-year-old than to a thirteen-year- old, suggestions are age-sensitive, and a variety of activities are proposed. 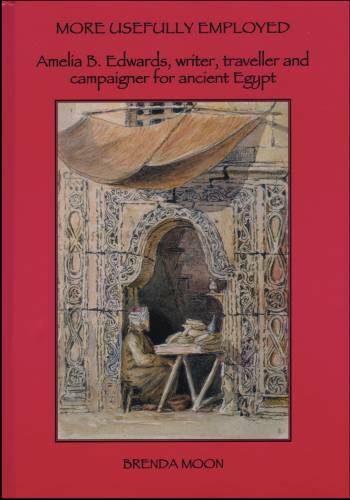 Also included are a detailed historical timeline and a recommended reading list to help children and teenagers get in the mood for a Cairene adventure. This does depend, of course, on how old the children are, and if they are actually happy looking around mosques and antiquities. This book is excellent, easy to read and use, and to be honest, is a perfectly good guide-book for anyone visiting Cairo, even if you don’t have children with you! It lists suggested books for younger readers and specific activities for children at some sites but includes some information surprisingly missing from other guide-books. This includes opening times and admission fees (so you can plan your day), information about how to get to the sites, what access is like (are there many stairs or lifts? ), and information about shopping opportunities at the sites. One feature, useful for everyone, is that it gives details of toilet facilities, where they are and their condition, which is always of interest to travellers. Interestingly, it does not mention the facilities at Giza (which, incidentally are very good) nor those at Saqqara (which are not as good). If you are visiting Cairo, even just walking around or visiting the bazaars in the evenings, then a guide book such as this one really is essential, as the city is full of buildings which pose the question "What is that?" It really is worthwhile spending some time in the city itself, away from the antiquities and this book will make such a visit much easier, more enjoyable and rewarding. I will be taking my copy back to Egypt on my next trip. Paperback. ISBN 977 424 791 4. Price £11.95. (or LE60 in Egypt). Town sites in Egypt are rare, and the site of Lahun, known as the town of the builders of the nearby pyramid of Senusret II of the Middle Kingdom, is of great importance. Lahun is one of the few town sites that have been excavated, primarily by Flinders Petrie at the end of the nineteenth century and in the early years of the twentieth. Excavations are still on-going at the site today and the archaeologists have uncovered the remains of large parts of the town, from substantial residences to humble dwellings. In addition, the town has yielded a huge range of domestic and personal items, which have helped us understand how the people in the town lived. Many of the objects are scattered around museums worldwide, but a large proportion are now in the Petrie Museum in London and in the Manchester Museum. 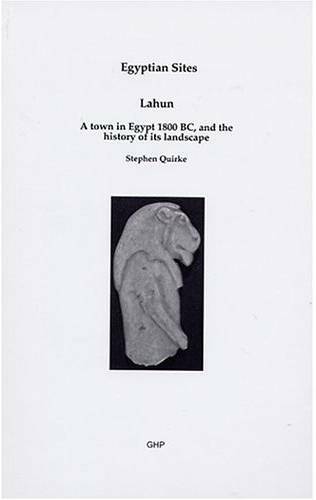 This book seeks to put the town of Lahun in its context and it reveals that there was in fact a community at the site in the Early Dynastic Period right through to the Roman Period and beyond. The main part of the book, however, looks at the town at its peak in the Middle Kingdom and its importance as the burial-place of a king and the centre of his mortuary cult. Chapters look at life both in the palatial mansions and in the smaller dwellings, using the evidence of the houses themselves, the finds of objects made in them (which include pottery, toys, amulets and papyri) and also the evidence obtained from burials at the site. The result is a book which is well-written and easy to read. It tells a remarkable story of life in an ancient Egyptian town, based firmly on archaeological evidence. It proves that objects and street plans, when correctly interpreted and analysed, can reveal so much fascinating information about the real ancient Egypt. Published by Golden House Publications. Paperback. ISBN 0 9550256 1 3. 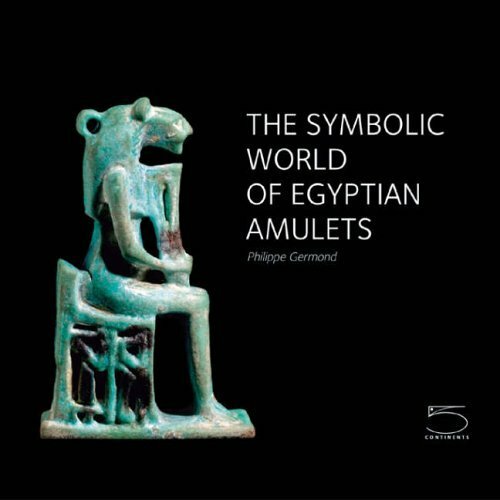 Egyptian collections almost always include many examples of amulets, and this book looks at the whole range of examples from a private collection made by Jacques- Edouard Berger. Amulets are often small but they can tell us much about religion and superstition in ancient Egypt as well as being decorative objects in their own right. Usually made of faience, their green and bright blue colours, and their small size and portability, explain why early collectors could not resist them. The book has chapters describing what amulets were and how they were used, before the main section, which looks in detail at individual amulets. The amulets are grouped together in various categories: "Animal Amulets" is sub-divided into "Domestic Animals", "Creatures of the Savannah and Semi-desert", "Creatures of the Nile and Marshes" and "Creatures of the Air". "Amulets of Gods and Goddesses and of Divine Attributes" are sub-divided into "Theban Deities", " Memphite Deities", "The Mythic Cycle of Osiris", "Child Deities " , "Familiar and Protective Deities", "Other Divinities" and finally amulets linked to royalty. Each amulet is illustrated in full colour, and on a large scale, often larger than "life", for many of the amulets are only between two and five centimetres high. 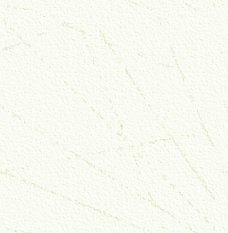 There is a good representation and description of every type of amulet. Though the examples illustrated may not be the greatest of works of art, unlike some examples illustrated in other books, they are, perhaps importantly, the most common and typical examples of their type. This is a well-produced and -illustrated book with good information and illustrations on amulets and anyone interested in the subject could do far worse than to add this volume to their collection. Hardback. ISBN 88 7439 244 3. It is entirely fitting that this new biography of Amelia Edwards be published by the Egypt Exploration Society, for it is almost entirely due to the efforts of Amelia that the Society (or Egypt Exploration Fund [EEF] as it was first called) was founded in 1882. Born in 1831, Amelia had a long and impressive career as a writer, a skill she developed at an early age. She wrote several novels, and articles for popular weekly publications, including many ghost stories. Her travel writing made her name, at a time when more and more people were venturing abroad. When her travels took her further afield than Europe, her life was changed in many ways. Her book A Thousand Miles up the Nile was a huge bestseller, the first popular travel book on Egypt and one that has been in print almost ever since. It is fair to say that Amelia fell in love with Egypt following a ten-month visit there at the end of 1873. She travelled the length of the country with her companions and other travellers she met in Egypt. Reaching as far south as the temples at Abu Simbel, she became more and more aware of what might yet remain to be discovered and how urgent it was to record and preserve the ancient art. This was a time when there was still little, if any, serious excavation work in Egypt and when monuments were being damaged and even demolished for their stone. On her return home she began her book, which she may have intended originally to be a simple account of her travels, as she had done with her previous titles; but she wanted to explain the urgency of taking some positive action to help preserve the Egyptian antiquities, and a campaign, which was do dominate the last two decades years of her life, began in earnest. Her book was published in 1877 and her campaign of letter writing, meetings, publications and letters in newspapers gained momentum. She was clearly not a lady to be ignored or put off with excuses, nor be dismissed by the academics of the time. Her perseverance paid off with the formation of the EEF, which enabled organised excavations and recording work to take place in Egypt. Flinders Petrie was one of her main archaeologists. At the time of her death in 1892, she had achieved much, including the funding and founding of a Chair of Egyptology, the first of its kind, at University College London. (She engineered that there would be no alternative to Flinders Petrie as choice for the first professor.) Over one hundred years after her death, her novels are now almost forgotten, but, as this book shows, were wellwritten and hugely popular at the time. Her ghost stories were a great success and Amelia’s morbid fascination with the trappings of death may go a long way to explain why she found ancient Egypt so appealing. This biography is a well-written account of a remarkable life and achievements. By looking at the full extent of Amelia’s life and times it is possible to see how her character developed and her experiences equipped her well for the struggle and achievements of her latter years. The author draws on Amelia’s own recorded recollections but also those of many of her contemporaries, colleagues, friends and especially her cousin, Matilda Betham- Edwards (whose biography is also mentioned below). Asked if she would ever write any more novels, when she was deeply immersed in her campaign for Egypt, her comment was that "I shall sin again in the way of storytelling I do not doubt, but I venture to think that, for the present, I am more usefully employed." 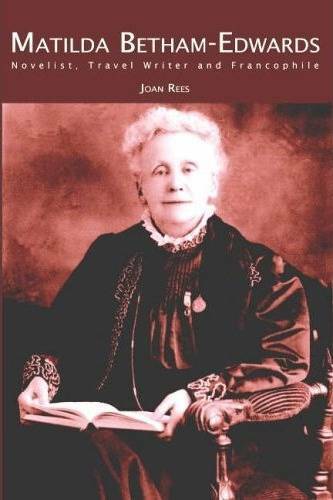 Her employment was indeed "useful" and the world of Egyptology today owes much to this one determined and remarkable lady, as this biography admirably shows. More Usefully Employed is a well-produced book, illustrated with contemporary photographs and also with some of Amelia’s own water-colour paintings, made on her Egypt trip, a number of which are reproduced in colour. Appendices give a summary of Amelia’s life, a list of her published works (which were considerable) and a summary of the plots of her novels. 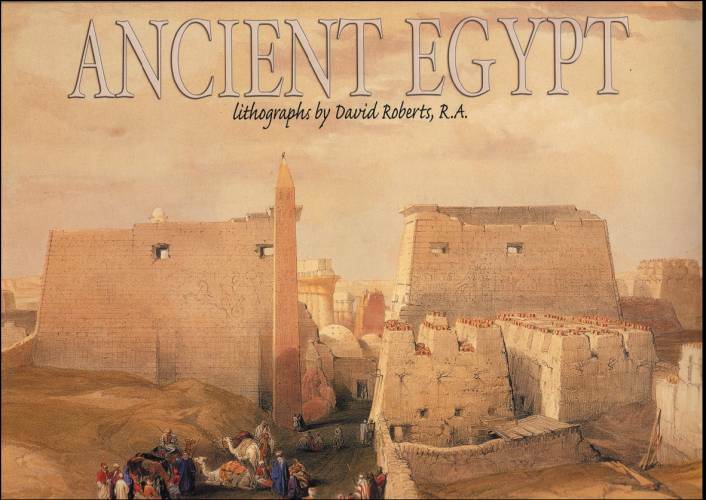 Published by the Egypt Exploration Society. Hardback. ISBN 0 85698 1699. Price £35 (£30 for EES members). Joan Rees wrote an article for AE on Matilda Betham- Edwards (Issue 30, June/July 2005). The article concentrated mostly on the fact that Matilda was a cousin of Amelia Edwards, author of A Thousand Miles up the Nile and founder of the Egypt Exploration Fund. The book tells of the life and career of Matilda, a remarkable mid-Victorian lady, who wrote her first novel at the age of twenty-one and her last when she was seventy. As this fascinating biography shows, Matilda’s interests were wide-ranging; she mixed with literary figures such as George Eliot and Henry James. She also worked hard to encourage understanding and sympathy between the United Kingdom and France, which she considered her second home, being of Huguenot descent. Published by the Hastings Press. Paperback. ISBN 1 904 109 012. This album has been reviewed in AE before (Issue 21, July/August 2003), but then it was a double CD, which featured ancient Egyptian and Hebrew music. This new CD contains only the Egyptian compositions but now includes a book, giving a description of every song, the full text (in English, German and French), along with the original hieroglyphic version and phonetic pronunciations of the translations. The book, the size of a CD jewel case, is illustrated in colour and is very well-produced, although there is one problem common to all information included in CD packages, in that the text is very small and not always that easy to read! It is a shame that CDs are not the same size as old-fashioned LP’s … but that a) shows my age and b) ignores the forward march of "progress" and technology. As the CD cover says, the CD comprises "Ancient Egyptian Texts Set to Contemporary Sacred Music" by composer Jim Berenholz, and is not, therefore, an attempt at a modern recreation of ancient Egyptian music, which is probably impossible anyway. Tracks on the album are drawn from many historical sources and include the "Hymn to the Aten" and pieces from the "Book of Coming Forth by Day" as well as new pieces written by the composer, who also sings and plays many of the instruments. The composer clearly has a love and feel for Egypt, a country he has visited many times. The music has been chosen as the soundtrack for films on Egypt and as the backing track for audio tours of some of the major Egyptian exhibitions currently showing in the United States, including the Hatshepsut exhibition at the Metropolitan Museum in New York and the "Tutankhamun and the Golden Age of the Pharaohs" exhibition currently in Florida. 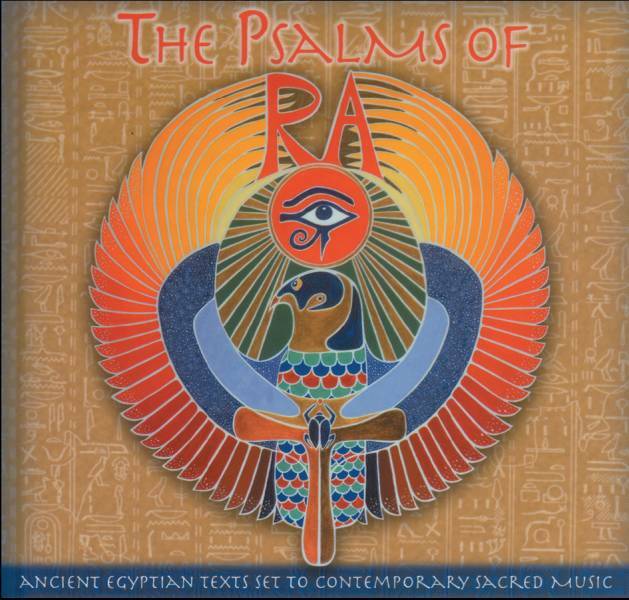 Title: The Psalms of Ra: Music in the language of light. Composer/orchestrator: Jim Berenholz and contributing musicians. Available from: www.psalmsofra.com email: info@psalmsofra.com Price: $25.99 (P&P not included). I stumbled across this CD by accident at the airport in Amsterdam, en route, as it happens, to Egypt. 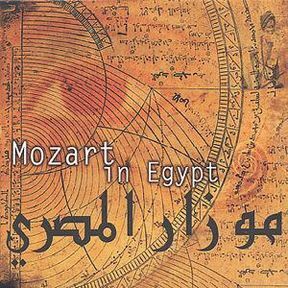 Many of Mozart’s compositions may have been inspired by ancient Egypt (even though he never visited the country), but this was not the ancient Egypt we know, or would even recognise today, for he lived before the European exploration of Egypt that began at the end of the eighteenth century. The recordings feature Egyptian musicians playing "modern" (i.e. not ancient) Egyptian music on Egyptian instruments, blended wonderfully with fully-orchestrated Mozart compositions that will be familiar to readers of AE. This might sound strange, and in fact I was doubtful about buying the CD unheard, but the result is a splendid album and one which has been almost constantly on my CD player for almost a year now! There is a great deal of information on the CD packaging (though it is even more difficult to read than usual for CDs) but I have been able to find that the CD is produced by Virgin Classics Ltd. You can order it on-line from Virgin, www.virginmegastores.co.uk/invt/223416, price £14.99, and it might be available (or you can order it) from Virgin stores or other music retailers.